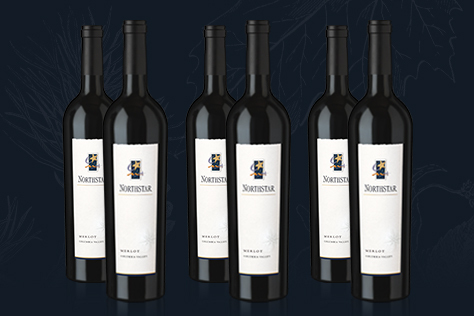 Northstar Winery brings you highly acclaimed, artfully blended wines from Washington State. Shop our current portfolio, from world class Merlot to elegant, limited production reds, and a fresh, crisp white. Aromas of black cherry lead into a palate ripe with raspberry jam, chocolate, cedar, and vanilla flavors. The wine has a full mid-palate and a rich finish of toasted oak. This limited production 100% Walla Walla Cabernet Sauvignon is velvety and soft. Aromas of raspberry and cherry intertwine with dusty malt and chocolate leading into a long finish of plum and vanilla. This full bodied wine truly expresses what Washington State Cabernet Sauvignon has to offer. Lush aromas of cherry, raspberry, and boysenberry lead into earth and spice notes with a long finish of chocolate and black cherry. Enjoy exploring The Cosmic Egg. Velvety, lush, and elegant, this limited production red wine from Walla Walla showcases notes of graham cracker, cherry, raspberry, vanilla, clove, and cinnamon leading into a long and satisfying mild toasted finish. Rich concentrated aromas of black cherry, plum, mint, cedar, and chocolate that lead into flavors of black raspberry and vanilla. The wine is big and bold and was created to enjoy now, or for many years to come as it will age gracefully. The 2017 Stella Blanca is a refreshing wine that offers notes of lemon, lime, and honey. On the creamy palate is a balance of lemon zest, and hints of vanilla and chamomile, giving way to a long crisp smooth finish. This lush and elegant wine offers aromas of black olive, pepper, and nutmeg leading into flavors of cherry, raspberry, toasted oak and vanilla. Soft and approachable from start to finish, this red blend affectionately known as “Stella,” has notes of blackberry, raspberry, cherry, vanilla, and cola. This limited production, first release of a 100% Walla Walla Cabernet Sauvignon is velvety and soft. Aromas of cinnamon and marshmallow intertwine with raspberry and black cherry leading into a long finish of plum and graham cracker. The 2014 vintage has rich concentrated aromas of raspberry, plum, mint, cedar, and chocolate that lead into flavors of nutmeg and vanilla. The wine is big and bold and was created to enjoy now, or for many years to come as it will age gracefully. Velvety, lush, and elegant, this limited production red wine from Walla Walla showcases notes of black cherry, raspberry, vanilla, and spices leading into a long and satisfying mild toasted finish. Velvety, lush, and elegant, this limited production red wine from Walla Walla showcases notes of cherry, blackberry, vanilla, black olive, and earthy, dusty spices leading into a long and satisfying finish. An opulent wine to enjoy with hearty fare. The 2013 vintage has rich concentrated aromas of cherry, raspberry and vanilla that lead into flavors of spice and chocolate. It is subtle and soft with a lingering toasted oak finish. This wine was created to enjoy now, or for many years to come as it will age gracefully. The 2012 vintage has rich concentrated aromas of cherry, raspberry and chocolate that lead into flavors of cedar and vanilla with a lingering toasted oak finish. This highly structured wine was created to enjoy now, or for many years to come as it will age gracefully. Enjoy! This limited production Petit Verdot displays aromas and flavors of smoke, vanilla, cocoa, raspberry and a base of rich dark fruit and spicy floral aromas. Aromas of cherry lead into a palate ripe with raspberry, cola, almond, and vanilla flavors. The wine has a full mid-palate and a rich finish of chocolate and toasted coconut. This lush, rich wine is ready to enjoy now, but will age gracefully for years to come.